Last July, on a decidedly damp summer afternoon in Glasgow during the 20th Commonwealth Games, Coach Pfaff and I were sat in an apartment overlooking Hampden Park Stadium. Whilst listening to the nearby roar of the crowd as a home town girl clenched gold, Dan and I had been chatting about the Scottish weather and relative merits of local coffee houses; but as always – our conversation moved onto various things Track & Field. It was the day after Steve Lewis’ Commonwealth Games victory. In the days previous I had been lucky to have the privilege of sitting next to Dan in a stadium buzzing with energy during two finals: one which culminated in Steve seizing gold – following a tense jump-off for outright victory; the second in which Christabel Nettey claimed bronze in the Long Jump in less than favorable conditions. As I had sat and watched these events unfold, one thing I was totally absorbed by was Coach Pfaff’s calm demeanor and clarity of expression. As such, I was intrigued to learn more about his views on the competition coaching process, and what thought trains had driven his decisions on those occasions. As always, questions started flowing, and the discussion revealed some fascinating insights. 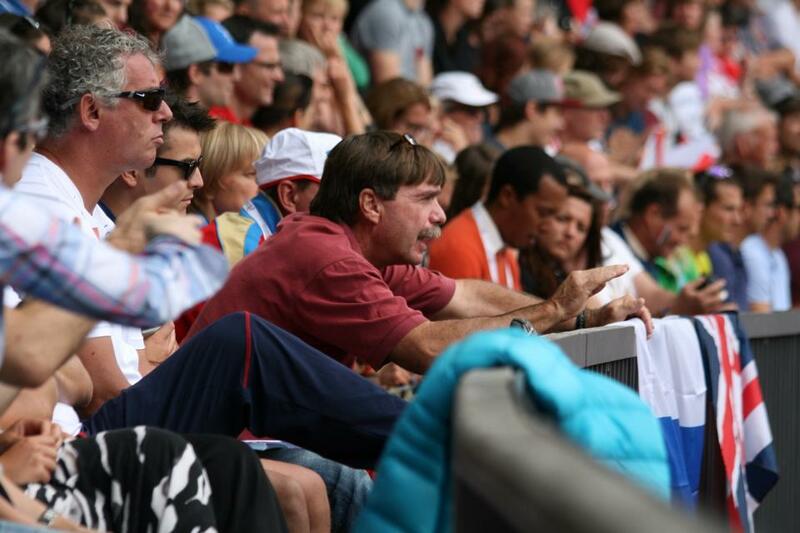 So, as 2015 gets underway and a new year of competition is set to begin, we thought it an apt time to record Coach Pfaff’s insights on competition-time coaching. Enjoy! Dan, what does a good competition coach look like to you? For me it’s a coach who has prepared the athlete and themselves well – tactically, strategically and program wise … where they should just be able to sit back, enjoy the moment and polish the car so to speak. In the 10 days leading into the major, and on game day, they should really just be there to reinforce positives and deal with last minute emergencies or what have you. How important is it in your opinion for a coach to be able to access the warm up area, or to be the last person to speak to the athlete before call up? I don’t think it’s critical. I think it depends on the age of the athlete, their maturity, and the support team that’s within the warm up track. I think it’s important to have someone that the athlete feels comfortable with on that day. 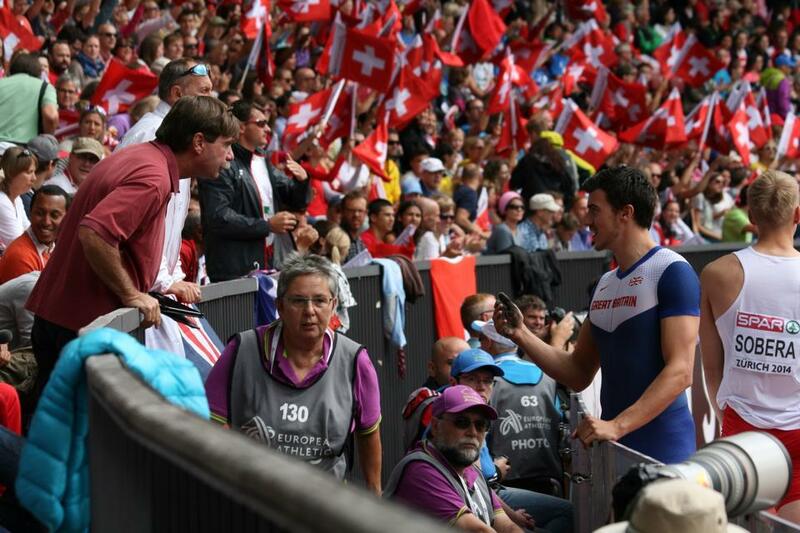 As an example, I’ve had medalists where I’ve been sitting in the stadium in the upper deck, yet I’ve had medalists where I’ve needed to walk them to the call room -so I think its individual to the athlete. The more mature, experienced and polished the athlete is, the less critical the coach-athlete interaction tends to be. So, as an athlete develops do you think they should become less and less dependent on the coach, to the point where the coach becomes pretty redundant in these situations? Well, I dislike this term dependent. I think it’s ambiguous and the coach-athlete dyad and coach-therapist-athlete triangle is about relationships not dependency. If you’re married are you dependent? Well you could be or you could not be; it’s a relationship so some relationships at times need more interaction and energy, and at other times they don’t – so it’s a truly individual and unique environment and analysis. However, I think it’s more about the state, stage and level of the relationship rather than any sort of dependency. It’s like in sports medicine; we don’t want the athletes dependent on the therapist. However, if a certain athlete needs more maintenance than another person do you call that dependence? Well I would call that prudence. So again, like in training theory it comes down to ‘what is the minimum effective dose?’ That should be the barometer. In terms of interaction at championships do you see a difference in coach/athlete communication at differing levels of competition; such as between a National, European and World Championships? I think it’s more about the importance of the competition and the stage development of the athlete. So if you’re dealing with a 19 year old kid at the Commonwealth Games, that may be the biggest thing they’ve ever encountered. If you’re a 30 year old veteran and you’ve been to 3 Olympics and 4 World championships, then the Commonwealth Games is really just another meet. So it’s the context of those meets as to the power or the puzzle that’s involved. For a coach that is going to a championship for the very first time with an athlete, what would be your advice to that coach in terms of best preparing the athlete and themselves to perform at that championship? Seek advice from trusted individuals spectrally – what to do, what not to do, what to be aware of. Most teams publish pretty good guidelines on weather, travel, and so on. So collect information, cover all bases and more importantly, rely on previous history with your athlete; what’s gone on at the various stages of development, at key competitions, is there a tendency for your athlete to react or behave in certain ways when they’re under stress? So I think it’s two pronged – develop your network of expertise, lean on it, and reflect on previous experiences in major competitions with your athlete. What are your thoughts on team coaching within a championship? Do you think it’s useful to have more than one coach present to help that athlete in the coaching area? Again I think it depends on relationships. For example, in the Pole Vault it’s a big fraternity. A lot of the coaches are co-operative and friendly, and so to have a coach catch mids and another to get take off, and another video – I think it’s positive. But you’ve got to make sure everybody’s on the same page and that they’re confident. I was at a meet a few weeks ago – a colleague of mine said they’d video and they ended up getting two videos out of ten! What do you think the role of a team coach within a championship should be compared to the personal coach? I think that they should be in dialogue with the personal coach, the athlete, the medical team, and all that before-hand – way out – before they get to holding camp. Then during holding camp it should be non-stop communication and interface with every athlete within their charge. However there of course may be some sort of pecking order, or hierarchy, where certain athletes needs more attention. If I have a low maintenance veteran, what’s my schedule on checking in with them to make sure things are where they need to be? So developing a big schematic of strategies and logistics I think is imperative for a team coach. What are your thoughts on the effects of pressure on a coach’s ability to think clearly and coherently during a competition, and the potential ramifications of this on coach-athlete interaction? I think there’s plenty of evidence out there that there are some great coaches during the year and during the fundamental meets that absolutely lose the plot in the big ones. I think conversely there are some coaches who may not be really great with programming or what have you, but at championships they just know how to push the right buttons. So I think it’s a bit of an art form again. I think a lot of people don’t reflect back to behaviors and body language, or tone of voice that they’re using in fundamental meets where everything is successful, and then continue that modus operandi. You know … it’s the old adage we give to our athletes – don’t try something new at a major, do what you’ve always done that’s worked. How should an inexperienced coach best prepare themselves for pressure situations or coaching at a major championships? Well there are a couple of axioms that I believe strongly in. Be positive; be as composed as possible; and be yourself. If you’re excitable at all meets stay excitable. If you’re reserved at all meets don’t all of a sudden become a cheerleader. If you are a person of few words don’t all of a sudden become chatty Cathy. If you know you’re OCD and you tend to over-analyze and over feedback; reign it in. So do an analysis of behaviors, trends and tendencies, then try to find middle-ground. During debriefs with your athletes for key competitions put everything on the table: rate me – what did you like, what did you dislike, what do I do that drives you crazy, what do I do that you really like? Some of my athletes trust my hands in therapy and awareness, so without it being said, if I am in the warm up area and I can do a body check that gives them big confidence. Like if I tell them to get up and they’re ready to go they’re like ‘hey I’m ready to go’ so finding those triggers that let people know they’re good to go is key. Have you ever dealt with a situation where you’ve had complete athlete meltdown – i.e. they’ve just been completely overcome by the pressure or the situation? If so, how have you dealt with that and got them back on track? Yea I mean that happens; but if that happens I think I’ve failed in the lead in. The ability to have full blown panic attack or anxiety attack at the moment of truth seldom comes out of the dark. There’s usually been commensurate behaviors at other times that lead one to believe that the potential for this meltdown could occur. So you’ve got to intervene years before, months before, weeks before. Trying to mix a major emotional storm on the day seldom works.